WE WILL NOT HOLD THE TRAIN FOR YOU IF YOU ARE RUNNING LATE. EASTER BUNNY EXPRESS 2PM. RIDE THE TRAIN AND HUNT FOR EASTER EGGS IN QUINCY WITH THE EASTER BUNNY! MOTHERS RIDE FREE WHEN ACCOMPANIED BY THEIR FAMILIES. THESE TRIPS ARE GOING TO BE DIESEL POWERED FOR 2019. FATHERS RIDE FREE WHEN ACCOMPANIED BY THEIR FAMILIES. THESE TRIPS ARE DIESEL POWERED FOR 2019. 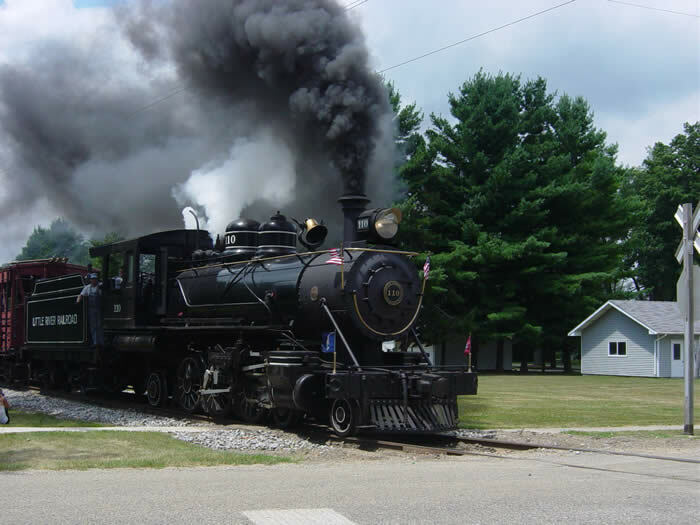 ENJOY THIS 45 MINUTE ROUND TRIP POWERED BY OUR STEAM LOCOMOTIVE NO. 1. ENJOY THE 45 MINUTE ROUND TRIP POWERED BY OUR STEAM LOCMOTIVE NO. 1. ADVANCED TICKETS NEEDED! CALL 517-227-5488 OR BUY ONLINE. DRESS FOR THE WEATHER! APPROXIMATELY A 1 HOUR 45 MINUTE TRAIN RIDE. Enjoy complimentary treats & Christmas Tour of the Depot! Enjoy complimentary Hot Chocolate and Cookies!!! Dates, Times & Events are subject to change, please check back often! Our Train is Handicap Accessible. Please let us know if you require assistance. 2019 PRICING Note: Some special event prices are different. TICKETS FOR ALL TRAIN RIDES ARE AVAILABLE ONLINE! ALL TICKETS ARE NON REFUNDABLE. PLEASE MAKE SURE YOU CAN VISIT US BEFORE YOU PURCHASE YOUR TICKETS. OF THE DATE OR TRIP YOU WANT TO EXCHANGE FOR. EXCHANGES MUST BE FOR THE CURRENT OPERATING SEASON. Pre-purchased tickets are highly recommended. Ticket office opens two hours before departure times. Tickets for all rides are available online or at our call center (517-227-5488). Tickets for any train ride can be bought at the station as well. WE WILL NOT HOLD THE TRAIN FOR YOU IF YOU ARE RUNNING LATE! You can rent a car, or the whole train. Perfect for Birthday Parties, Family Reunions, Office Parties, School Outings. Email or call for availability and more information. Rental price includes tickets for all passengers in rented car. No need to buy additional tickets. LRR will not guarantee which car and where it will be positioned on the train. Train cars can only be rented on days the train is running.